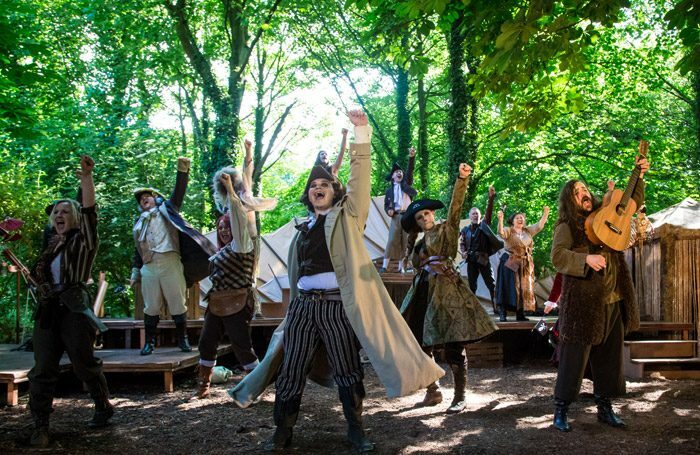 It’s shaping up to be a sun-blessed season for travelling troupes bringing live theatre to the nation’s parks and gardens. Mate Productions is a Merseyside community arts organisation that puts on performances in locations from woodland to warehouses. On this occasion, fittingly, this boisterous steampunk version of the Robert Louis Stevenson high seas adventure was presented in the garden of a former Victorian shipping magnate’s home. Treasure Island has always been a boys’ own fantasy, but Phil Willmott’s adaptation re-assigns some of the roles to add female adventuresses to the roster of grizzled old sea dogs, including cut-throat Shashka Dimitri (Holly Blue) and a pistol-toting Lady – rather than Squire – Trelawney (Cassie Richardson). The show, produced and directed with invention and swagger by Gaynor La Rocca, also ups the comedy quotient. Kristian Lawrence in particular is a wily scene-stealer as the cheese-obsessed castaway Ben Gunn who sees a surreal musical mirage of cavorting wedges of brie, Edam and Stilton. The energetic action, complete with effective percussion choreography and original music, unfolds on Mike Dobson sturdily simple wooden set with moveable steampunk sails, while puppet parrot Captain Flint is a charming combination of metal rocket, gold mantel clock and Clangers’ soup dragon. Like its piratical anti-heroes, it’s occasionally a little rough around the edges. But this Treasure Island certainly shows what can be done on a tight budget with plenty of imagination.